A new poll shows a majority of voters trust Larry Hogan, Maryland's Republican incumbent governor, more than Democratic challenger Ben Jealous on issues that voters say matter the most. WASHINGTON — A new poll released by Goucher College shows Maryland Gov. Larry Hogan has a 22-point lead over Ben Jealous, a Democrat. The poll suggests a majority of voters trust the Republican incumbent more on issues that voters say matter the most. With only about a month and a half before the election, it suggests Jealous has major ground to make up in all corners of the state. The Goucher Poll of 831 adults taken last week gives Hogan a 54-to-32 lead across Maryland. The margin of error is plus or minus 4.5 percent. It’s a substantial lead when considering that the issues Jealous is running on are shown to resonate among Maryland voters. But even in the D.C. suburbs (defined as Prince George’s and Montgomery counties in the poll) and in the Baltimore metro area, Hogan’s lead is outside the margin of error. And nearly three-quarters of likely voters say their minds are made up. Even among Democrats, Jealous wins only a plurality, leading Hogan 48-to-38 percent. Democrats enjoy a significant registration advantage over independents and Republicans in Maryland, and among those two groups Hogan enjoys a substantial advantage. Independents lean to the incumbent by a 57-17 margin, and Hogan’s lead among Republicans is a 91-1 spread. In the case of the economy, education, and health care, a majority of voters say they trusted Hogan to handle their concerns better. Most voters also say their opinions about President Donald Trump, who is very unpopular in Maryland, won’t matter in this race. Hogan’s substantial lead comes even though an increasing majority of voters favor increasing the minimum wage to $15 an hour, something Jealous has campaigned on. Nearly half of those surveyed also believe the state’s tax system favors the wealthy. Income inequality is an issue for Jealous. Jealous also wants Medicare for all, an idea more than half of Maryland voters say they support. But there’s less of an appetite to actually make that idea a reality, with voters preferring the state to improve the Affordable Care Act. 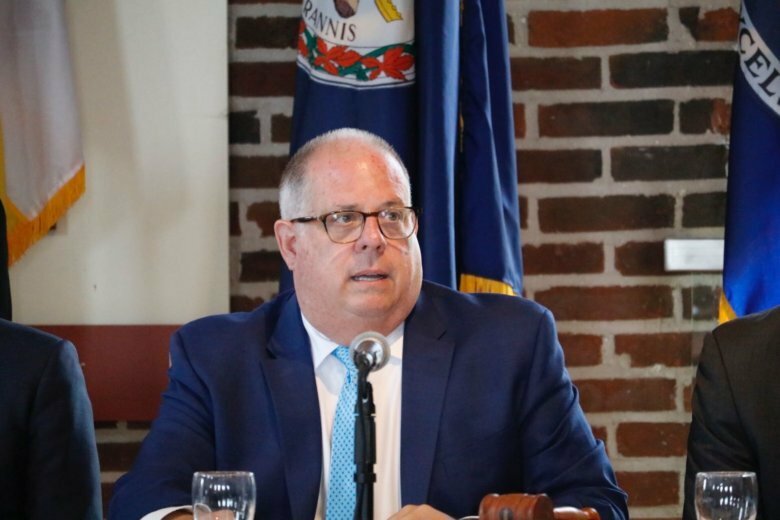 Only 35 percent of voters say they’re more confident in Jealous’ ability to oversee health care in the state, while 51 percent say they have more confidence in Hogan. When it comes to the other candidates for governor, Green Party candidate Ian Schlakman and Libertarian candidate Shawn Quinn each have the support of 1 percent of those surveyed, while 9 percent remain undecided. In other races, Sen. Ben Cardin, D-Md., appears to be on his way to reelection. The Democratic incumbent leads Republican Tony Campbell by a 56-17 margin. Independent Neal Simon is picking up 8 percent of the vote, while 14 percent are undecided. Attorney General Brian Frosh is up 58-26 on Republican Craig Wolf, with another 12 percent undecided. In a poll done in August by Gonzales Research and Media Services, 52 percent of the voters surveyed said they’d support Hogan over Jealous.